Summary: Learn how to fix a leaking toilet, identify where the leak is coming from and repair the leak. Fixing a leaking toilet may sound complicated, but in fact it can be achieved by the average DIYer quite easily. Make sure you have located the source of the leak. To do this, wipe the leaked water with a towel and as you do, try and spot where the first onset of water appears from. Looking at the potential problem areas of a toilet can help you identify what is causing the leak and how to counteract it. Problems often occur in the toilet cistern. Have a look inside the cistern to see if there are any obvious issues with the fittings. Check the handle and trip lever isn’t caught up and not operating properly. If you need to adjust the chain linkage by taking some slack out of it, then you may have to detach it, remove some links and reattach. The flush valve component is another potential problem area. If this is not working properly, it may cause the tank to keep filling up. There is usually an overflow tube which prevents the tank from overflowing, the excess water will run into the basin. Another cause might be a faulty seal at the base of the tank where the pipe connects. 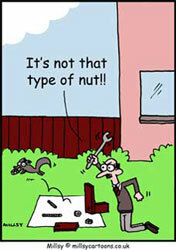 This may be possible to fix by tightening the nut. If the problem persists, you may need to shut off the water supply and take the pipe apart. Check the state of the seal; if it is not in a good condition you may need to replace it. The last likely problem which can cause leakages is a fault with the bolts that are located within the cistern. These bolts connect the cistern to the toilet and if not tight enough, will allow water to pass through the hole. Tighten the bolts. If the leak persists, you may want to replace the rubber washers.